Learn all about Isle-sur-la-Sorgue Village-monde. 500 women and men and more than 300 ambassadors of L’Isle-sur-la-Sorgue and its area have a collective goal : to preserve and give life to their particular « Village-monde » by creating tomorrow’s ideal city. The idea is to build a territory where women and men can preserve a high quality of living while at the same time benefitting from the services and the open-mindedness of an innovative city that favors the well-being of people (inhabitants, employees, and visitors), businesses, and, of course of the whole territory. The success of this collective project requires « positive isolationism » and calls upon the values of simplicity, proximity, altruism, open-mindedness, liberty, friendliness, optimism, well-being, passion and the desire to share that will allow this « Village-monde » to be a « positive-city laboratory ». Its development is thereby associated with a positive economy coming from sustainable development, altruism, and the passing on of the basis for tomorrow’s economic performance to the next generation. This ambition is shared, reinforced by community effort, by excellence, by experimentation, by innovation and responsibility. What is the ambition of the “Isle-sur-la-Sorgue Village-monde” measure? In a context of increased competition between the territories and a globalized economy, the city of L’Isle-sur-la-Sorgue launched its « MISSA » on May 10 2017. In April 2018, it became the « Village-monde » attractiveness measure, with objective to reinforce the territory’s competitiveness and attractiveness. Inspired by the most high-performing territories in the world and supported by the « Attractiveness and new territorial marketing » chairman (A&NMT) of the IMPGT (Aix-Marseille University) as well as the territorial consular seats, this ambitious measure seeks to mobilize collectively the most impassioned inhabitants as well as the institutional and private participants most committed to their territory. What are the goals of L’Isle-sur-la-Sorgue? A dynamic diagnostic demonstrated as well that the city continued to suffer from structural quality problems, which decreased its attractiveness, especially with regard to organization, financing, and the quality of its services and amenities. This collective effort brought several weaknesses to the forefront, thereby pinpointing the objectives that needed to be pursued in order to establish the attractiveness strategy as well as the shared action plan. - To synergize L’Isle-sur-la-Sorgue with other territories and « front doors » pertinent to its own area (Provence, Avignon, Cavaillon, Luberon, Mont Ventoux, …etc.) but also with other major actors such as French Tech, clusters, Avignon theatre Festival, etc. - To improve the efficiency (and thereby the impact and results) of the city’s economic, touristic and cultural marketing. In general, it was concluded that L’Isle-sur-la-Sorgue needed to better control its development and attractiveness by using a more sustainable and high-quality approach. The ambassadors are at the heart of the strategy of attractiveness of the L’Isle-sur-la-Sorgue brand and its territory. For us, the participation of the ambassadors is the first condition for the success of our actions to favor development and to increase the attractiveness of our territory. 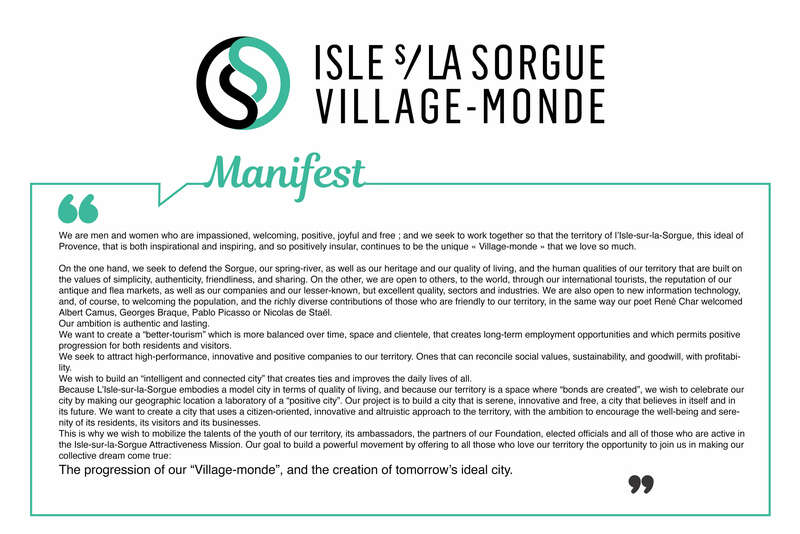 As noted in our « Village-monde manifest »: « we seek to build a powerful movement by inviting everyone who loves our territory to join us in advancing our collective dream: making our « Village- monde » progress and inventing the ideal city of tomorrow! » Even though we do not have the power of a big metropolis, nor that of very big businesses or universities, we are certain that with our remarkable quality of living and the singularity of our « Village-monde », carried on by the love and commitment of our ambassadors, we possess a major advantage which will allow us to build the future of our territory. It just shows how important you are for us! When we talk about attractiveness and territorial marketing, what are we talking about? The attractiveness of a territory is its capacity to shine, to promote its offer and to attract or retain, punctually or permanently, persons, talent (entrepreneurs, tourists, students, researchers, managers, doctors, retired persons…), businesses, startups, sporting, cultural or business events (such as fairs, conventions or seminars) as well as capital (investors, developers). Territorial marketing is the set of techniques and tools that permit the creation and development of a territory’s attractiveness. When we talk about marketing for L’Isle-sur-la-Sorgue, we are speaking, of course, about shared citizen marketing. This consists, first, of the cultural identity of the territory as well as of its needs, its partners and inhabitants, turned to the needs and expectations of its main clients, be they investors, business entrepreneurs or tourists. This task is the result of co- construction with all of the driving forces of the territory: economic forces, social forces or environmental forces. All sectors of activities are concerned, especially agriculture, industry, tourism, culture, handcrafting, training and teaching. What is at stake for L’Isle-sur-la-Sorgue ? The economic and financial benefits come from the development of new expertise, the stimulation of new sectors of excellence, the development and encouragement of business, the reinforcement of investment and, of course, the optimization of the expenditures of tourist and business clients. As many other cities in France, L’Isle-sur-la-Sorgue has faced unprecedented decreases in Government funding, along with a higher-than-average level of debt. The city must therefore be extremely efficient in its attractiveness strategy, in finding new sources of financing and by helping companies to better promote their offer in a more challenging and competitive context. The quality of living and service level benefits come from new offers for services, business and leisure, from site planning and maintenance of the local heritage as well as from the organization of events and the arrival of new talent to the area. The « cultural » and «identity » benefits come from inhabitants’ increased attachment to and pride in belonging to the territory but also to a greater sharing of cultures as well as openness to the world and to others. Benefits to internal dynamics : as a source of collective thought and reflection, an attractiveness measure along with shared marketing encourages elected officials and institutional technicians to work closely with the territory’s driving forces for the development of initiatives and the creation of internal dynamics, in particular in the areas of innovation, creativity and entrepreneurism.